The HFCM series conical monopole antennas are an excellent choice for omnidirectional HF communications where both ground wave and sky wave coverage are required. The electrical performance of HFCM series HF conical monopole antenna is nearly similar to the theoretical performance. Due to its large diameter/height ratio the HF vertical conical monopole has excellent VSWR and pattern performance over a very wide frequency range, as compared to other conical monopoles manufacturers. All version of HF vertical conical monopoles antenna operates at full efficiency over the specified HF bands. The true wideband capabilities of the HF conical monopoles are achieved with full radiation efficiency. 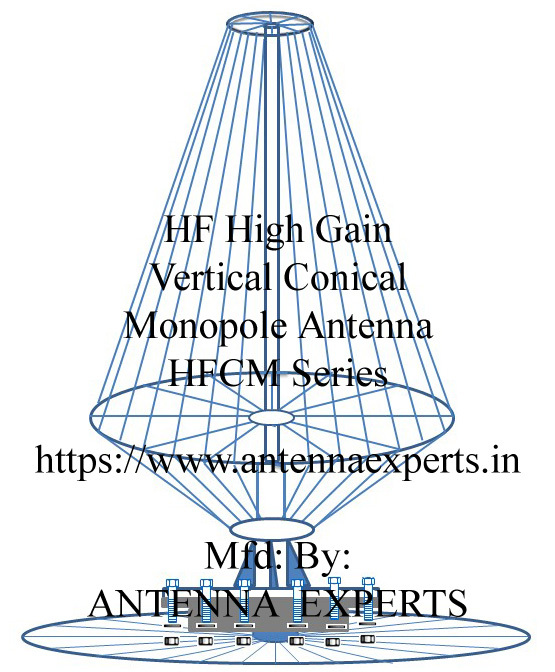 The HFCM series HF conical monopoles antenna uses no tuners, no special coupling units, no terminations, no resistors to achieve its high bandwidth, nor does these uses any techniques or devices to couple RF energy to the ground, an approach sometimes used to increase bandwidth (at the expense of efficiency). The HFCM series HF vertical conical monopoles are the simplest and safest antennas to erect in its class. The structure of HF conical monopoles above 10 MHz is fully stable during the rigging sequence, without the need for temporary guys. Once erected, all the HFCM HF monopoles antennas have outstanding structural rigidity, troublesome deflections and mechanical oscillations do not occur. All HFCM series HF conical monopole antennas uses high quality, exhaustively tested components and materials. All radiators are of Alumoweld, a wire composed of a high-strength steel core and a highly conductive, corrosion-resistant coating of aluminum. All insulators are made of high-strength DELRIN, a material with an extremely low loss tangent that is virtually impervious to the effects of UV and salt spray. All nuts, bolts, split washers and fasteners are made of marine grade stainless steel. Dissimilar metal contacts are avoided to the extent possible, and where they are used, measures are taken to prevent corrosion. A working life of 20 years or more is standard with the HFCM series HF vertical conical monopole antennas. All the HF conical monopoles antennas are supplied in kit form dismantle condition with all required materials including the mast, guys, curtain, ground screen (earth mat) and foundation hardware.